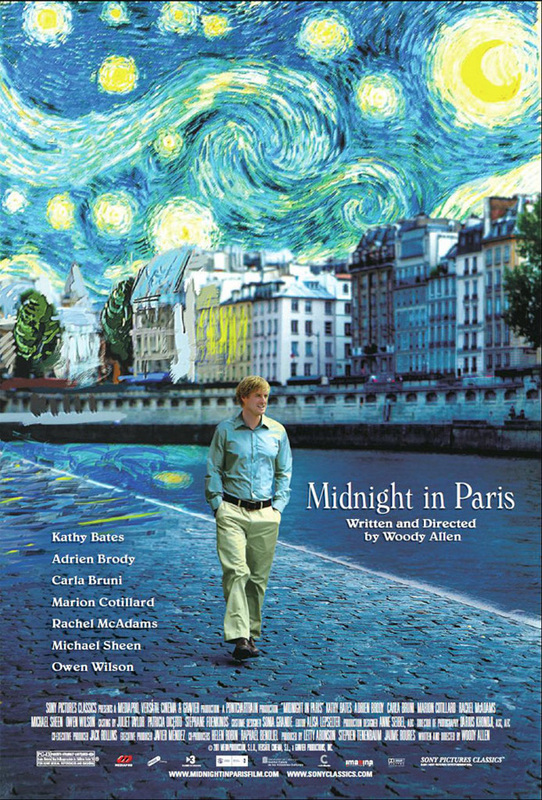 Midnight In Paris, Woody Allen’s 41st feature film, has a bit of a misleading trailer. This trailer, which can be viewed below, portrays the movie as a simple romantic comedy set in the gorgeous city of Paris. This is not entirely accurate. Sure, the movie is a love story, and it’s true that it is set in Paris, but there is a startling twist that throws everything in a different direction. While many reviewers have found the need to spoil this twist, I feel that it would be an injustice to reveal the movie’s curveball. Consider this a spoiler-free review. The film stars Owen Wilson as Gil Pender, a bored Hollywood screenwriter who aspires to write a successful novel. Gil and his fiancee, Inez (Rachel McAdams), have joined her parents on a business trip to Paris for a relaxing getaway. Gil immediately falls in love with the city, frequently dreaming of walking in the rain in 1920’s Paris. He waxes nostalgic, often thinking of what he assumes to be greater times. Inez, on the other hand, while appreciative of Paris is more concerned about spending time with her old friend, Paul (Michael Sheen), who just so happens to be visiting as well. Paul is the pseudo-intellectual type, a guy who acts as if he knows everything about everyone, and Sheen plays him to perfection. In fact, the acting is pretty damn good all around. I am not an Owen Wilson fan at all, but I enjoyed him here. This might very well be the best role I have seen him in. Rachel McAdams does well as Gil’s bitchy fiancee, although I get the feeling that anyone could have stepped in for this part with little difficulty. The supporting cast, however, is what really helps this movie. Corey Stoll, Kathy Bates, Adrien Brody, Carla Bruni, Marion Cotillard and Tom Hiddleston, to name a handful, all have fun roles of varying degrees of importance. Cotillard, in particular, shines as the beautiful and charming Adriana. Without getting too much into their actual characters (for risk of spoilers), let’s just say that the cast fits their counterparts perfectly, which is an admirable feat. It’s clear from the film’s opening three minute montage that Woody Allen is enamored with Paris, and this is basically his love song for the city. There are some truly stunning shots of the City of Light, and this movie really makes me want to go back and visit. Unfortunately, while Midnight In Paris has a strong cast and some marvelous shots of the city, the movie itself feels a bit flat. The aforementioned “twist” is initially intriguing, but the jokes and running gags related to it grow old after a while. I didn’t find the movie as funny as others did, although Adrien Brody’s cameo had me cracking up. Also, even though many of the small roles were entertaining, it felt like the movie introduced way too many characters and gave them little to work with. Even some of the more “important” characters kind of disappeared into the background after originally being introduced. Essentially, Midnight In Paris is a good, but not great, movie. It has some interesting ideas, but never quite lives up to its potential. However, this is a must-see for those who fancy American literature and European artists as there are numerous references to Hemingway, the Fitzgeralds, Picasso and Dali, to name a few. If that doesn’t sound like your cup of tea, then you may want to pass. Thanks, Castor! Yeah, it’s definitely a charming movie but it never quite reached the next level for me. I agree about the rapid one-liners — there were so many of them, and some felt a little forced. Nice review. I had no idea there’s some kind of a twist in this movie but your review makes me more curious about this movie even more. The Paris scenery alone looks beautiful, that’s kinda the main draw for me as I’m not crazy about the lead actor. Thanks! It’s worth checking out if you are drawn to the Paris setting, and Owen Wilson is actually pretty decent for a change. I just didn’t fall head over heels for the movie as so many others seem to have. I probably won’t fall head over heels for this, either. I’m not generally fond of Woody Allen movies, I mean they’re ok, but nothing spectacular. That’s understandable. Let me know what you think if you do end up watching it! I agree that they touched on a few too many topics without giving them their due, but it is a wonderful story with beautiful scenery. Check out my review and tell me what you think!